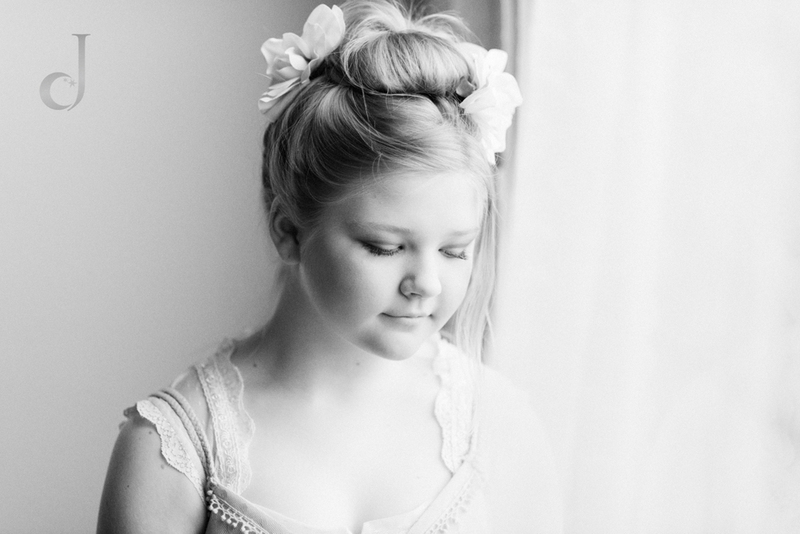 Ellie came in to have her portrait session after mom saw the invitation for the Little Women sessions on Facebook. These sessions are designed to give girls who are between 10-12 an extra boost of self confidence. Those ages can be especially hard for kids. They aren't little kids anymore, but they aren't yet teenagers either. They have new hormones and feel caught between wanting to be young and still play like a kid and wanting to feel all grown up and get taken seriously! It can be tough to feel confident too with all the different messages that society gives young girls on how they should look and act. Mom felt like Ellie would love to have a session where she got to feel special and get dressed up. Ellie is a dancer and we were able to have her dance in the studio! She is a very quiet girl and though I knew she had a great time it was lovely to have her mom tell me that after our session Ellie couldn't stop talking about her time with me! Both mom and Ellie were thrilled with the time we spent together. I sent questionnaires to mom and dad without Ellie knowing. There are all kinds of questions in them that draw out how parents (and coaches and teachers) see their child. When Ellie came back to the studio to see her portrait slideshow the quotes that you see on some of these images were shown to Ellie for the first time too. It was such a lovely way for Ellie to get to know what her parents think about her and what they hope for her. Mom has said the session really has helped Ellie and I couldn't be happier for her! She is a sweet and kind young women and was glad to get to know her! I feel really grateful to get to contribute a positive experience and some lasting artwork and emotions all together to these families.